Are you tough? Is skating the most important thing in your life? Can you not wait to get on the track and pound the hell out of the opposing team? 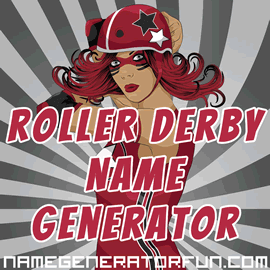 Then buckle up and get into action with our roller derby name generator! Grab your quad skates, your knee-pads and your helmet, and get ready for some jams! If you're a team player, you love skating, you don't mind getting bruised, and beating the heck out of the other team sounds like a fantastic amount of fun, roller derby may be for you! If you're into skating, you need a great name. Much like wrestlers, roller derby players love creating shocking, memorable, and funny pseudonyms for themselves. They want the audience to remember who they are so their badass reputation goes with them! But inspiration doesn't always come easy, and that's why we created this generator! That distinctive player identity you've been looking for is waiting right here, and you can create a random roller derby identity, or you can get one that's specifically based on your own first and last name. 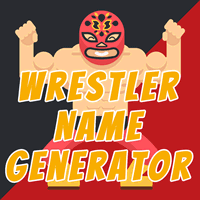 The generator can create both male or female names (for anyone who's into the sport). In recent years, roller derby has been largely a women's sport, but more men's and mixed teams are appearing. It's ideal if you've just joined a new derby team and you are looking for a fresh name, or if you want a memorable screen name on social media, or if you just want to bring a little punky attitude and fun to your day! This generator was great fun to build. We designed it by putting together some big lists of the coolest, toughest, funniest names we could find. If you enjoyed it, you might also enjoy our Space Mutiny names and our cool names.